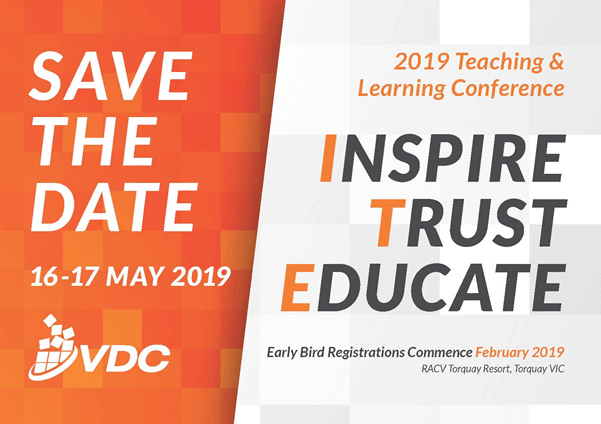 The 2019 VDC Teaching & Learning Conference will be held on Thursday 16 and Friday 17 May 2019 at the popular RACV Torquay Resort on the Great Ocean Road in Victoria. The program has been revamped and extended to include more interactive workshops that will be facilitated by the high profile key note presenters at the conference. The theme of the conference is how educators can Inspire, Trust, Educate themselves and their students. Early Bird Registrations commence February 2019. Register your interest here.